Late last night The Wife mentioned she hadn’t seen a Fragments blog post in a while. I’ve been around the block enough times to know that if your wife points something out to you, you pay attention to it. I resolved to making sure today did not go by without an update to Fragments, so here we go. I’ve been finding it harder and harder to find the time to post to this blog, but it’s important to me that I at least try and continue to do so. If I’m going to keep a link to this blog on my various forum signatures around the web I really need to stay on top here. What’s more important is the content. I’m sure many of you are interested in the mental workings of my mind, but let’s face it; according to the statistics on my blog more of you are interested when I have something of substance like my Edge of the Jedi rules or a build thread about a costume I’m working on. Let’s see what I can do with that. The GenCon Mod is coming along and growing. I’ve done quite a bit of re-working. I’ve realized that my long-winded writing style doesn’t work very well when introducing a con-module. It was pointed out that my opening speeches were too long and too verbose. I needed to get the PCs into the action, or at least the interaction, a lot quicker. So I trimmed off an entire page of dialogue and replaced it with a paragraph. Got rid of some useless bookkeeping, added in some ties to some of my plot threads, and cleaned up the flow of the module. All this should allow the module to flow better and fit into the time-frame I have set aside for the adventure. I’ve got time set aside in my GenCon schedule to run the module twice, and if I find myself with a few hours to kill I may do a bonus run or two. We’ll have to see what time allows, because I do want to do other things besides running the adventure. This weekend I’m going to look at printing options for the maps for the Huttball encounter and (thanks to Chris West at Maps of Mastery) the final encounter to the module. The Huttball map is an odd size, about 40”. I need to talk to the folks at the print shop if I should print it as an odd-sized poster or as a banner. I’m worried the banner won’t be as good a print as the poster, but it allows for a larger surface and a little more structurally sound. NOTE: As an aside, Chris West is going to be starting his next Kickstarter soon, first one in over a year. Finally releasing his Space Station Maps, and pout a preview for it up on Facebook. It looks AWESOME. The PCs and NPCs for the module are coming along nicely. During one playtest one of my PCs stated that “no one was playing huttball, everyone was just attacking each other”. Now, the encounter is based on a PVP Arena zone in Star Wars The Old Republic, but she’s right. The objective, and how you win Huttball, is to score more points than the other team. Attacking your opponents are simply a tactic to make scoring easier or preventing them from scoring. Another problem was a mistake I was making; I was basically setting up my NPCs as opposition and not really playing them like they would to play Huttball. Everyone rushed the center, or attacked the ball carrying PC. No one was going long for a pass, or moving to prevent the PCs from getting the ball. So I went through all my NPCs who could appear in the huttball match and gave them one-paragraph notes on how they will act when playing the game. Some will be all over the sport, some will enjoy the combat aspect, others will play a tactical-reserve game, and some will just be in there to hurt people and if they get the huttball they’re just as likely to toss it away because it throws off their aim. It’s gonna be fun…32 days and counting. The Age of Rebellion core rulebook finally released last week, and I picked up my copy from my Friendly Local Gaming Store (at a discount; the benefits of membership!) One thing I immediately focused on was how damn pretty the book is. The artwork in prior books in the companion line (Edge of the Empire) was good, and even some of it was re-used in this book, but my word the artists out-did themselves in this book. So many iconic characters, and not-so Iconic ones. 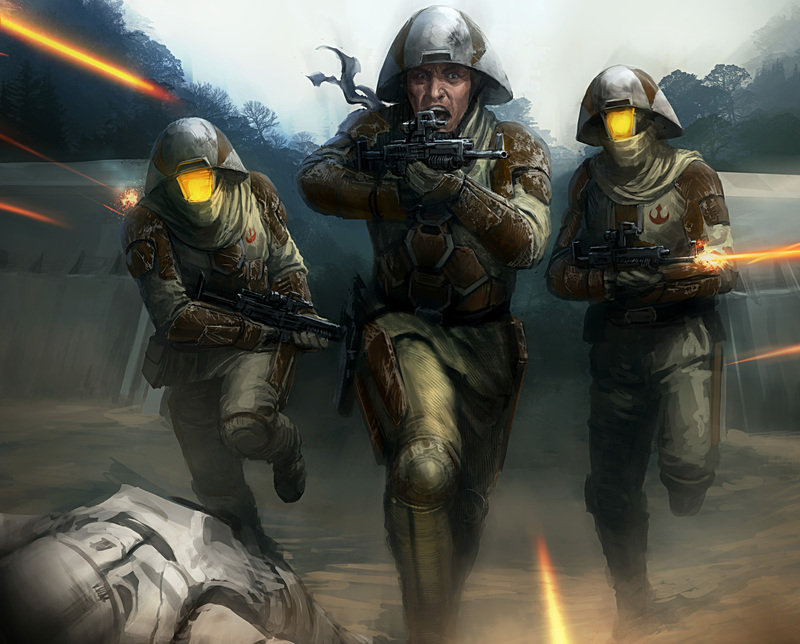 One artist did Rebel Battle Armor from the old Star Wars Galaxies game, which made me long to see some updated imagery for my old R.I.S. Battle Armor my Armorer had made back in the day. One artist who has done some phenomenal backdrops in the various FFG books is Mark Molnar. I really enjoy his works, as they capture the high-tech yet desolate locales in the Star Wars Galaxy, and in some cases the vast urbanization of entire worlds. His starships are majestic. It’s just…insane. Another great artist I’ve enjoyed is Anthony Foti. His character portraits are incredible. Absolutely gorgeous and inspiring. Its artists like these that give me an urge to find a Computer Painting class at a local college and really learn how to get the most from some of these programs I have. I’d love to do art a quarter as good as these guys. My only issue is time, and the fact I don’t have much of it. But I suppose if I really want to get something done I will set aside time for it. So that should do for now. Once I’m “done” with my GenCon Mod I can start to focus on my impending Star Wars campaign, Another Longshot. I really want to have this game be an “in-person” game as much as possible, but I may have to resign myself to the fact that I can never get everyone I want to at the same place at the same time. I’ll just be happy to get my Expatriate Gamer and former co-host Alex back from Georgia in October. Speaking of co-hosts; I’m still the “Regular Guest Host” on the Order 66 podcast for the immediate future. 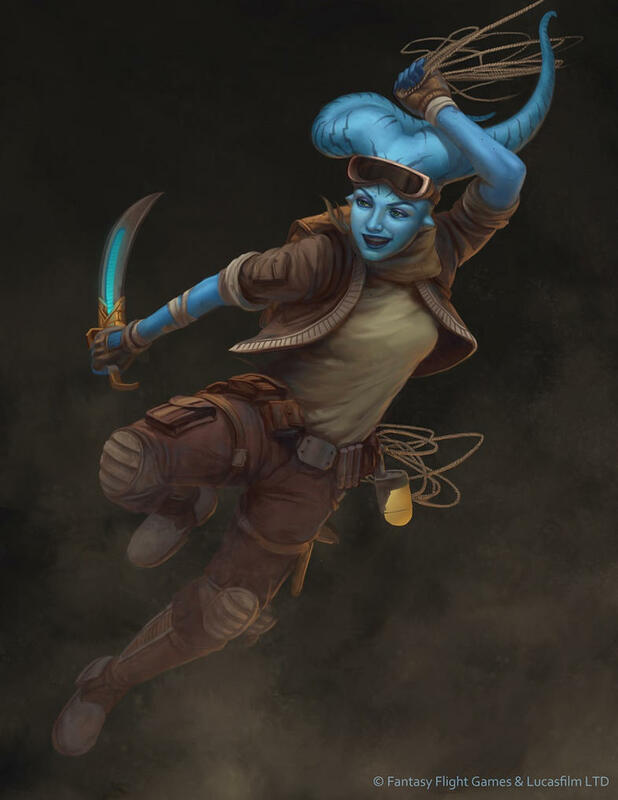 This week we’ll be talking with Art Director Zoe Robinson from FFG about Rebellion Era Campaigns.